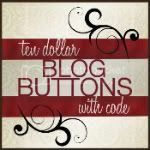 Be sure to click here and enter my giveaway for a free blog button with code. Winner to be announced this Friday! Sweet list! Hope your week is blessed! Amen! There is so much to be thankful for. We are blessed people! Love your gratitude list. Hoping your week is off to a good start. That was beautiful. I have to remind my family and myself often, that "all things work together for good to him that loves God". That is so simple and can get you through anything. ALl you have to be concerned with, is loving God, and he takes care of the rest. What freedom! When you see your babies love God and pray to Him, you know that all things will work together for good for them, and that is peace. So beautiful; His love never fails.